Self or static cling (commonly used for car tax discs) is an electrostatic PVC film suitable for shop window stickers and point of sale material, supported coated backing. This is a material that is easy for the uninitiated to install as it is easily repositioned and won’t be wrecked if the sticker’s surface touches itself. Unlike self adhesive vinyls which may leave adhesive behind, self cling are easily removable leaving clean glass and can also be reused. 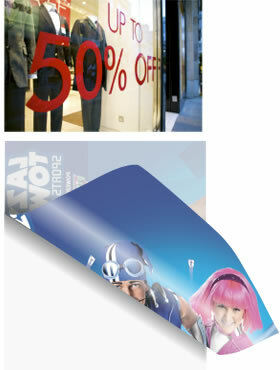 Self cling comes in clear or white finish and in roll or sheet form.